Timber Wolf Atomic Steel Full Tang Stonewash Modified Drop Point Dagger | BUDK.com - Knives & Swords At The Lowest Prices! 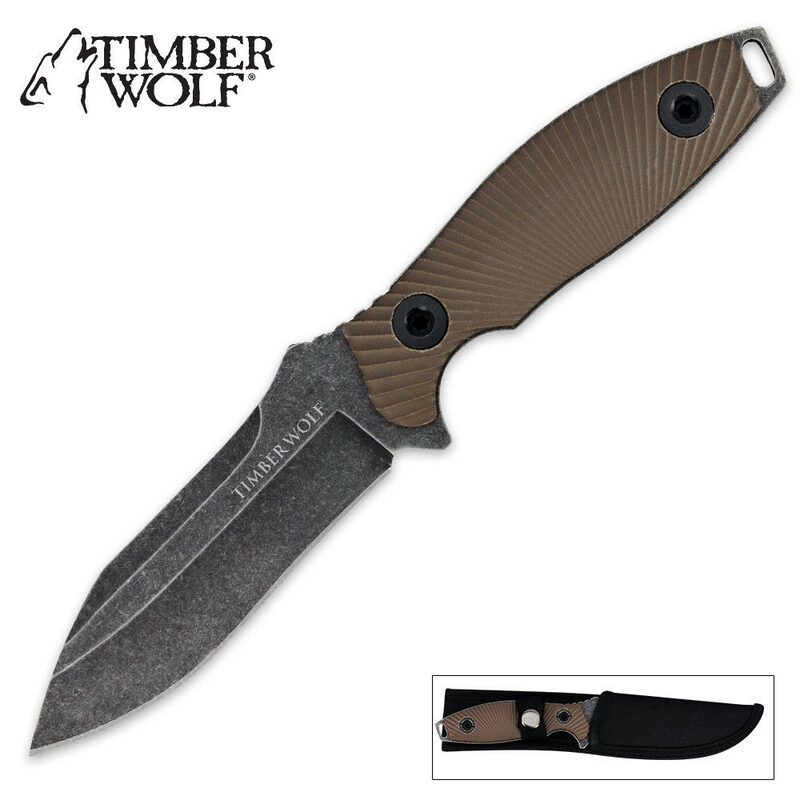 Timber Wolf is proud to release an all-new collection of Atomic Steel stonewash tactical blades that is sure to get your attention! This powerful Timber Wolf Atomic Steel drop point dagger features rock-solid, full-tang 4MM stainless steel construction with an attractive stonewash finish. The textured, G10 handle provides a sure grip for supreme control as you work this blade. Attach a lanyard to the end, and you'll have yourself one mean blade that's up for any challenge! Great hefty firm blade. Love the g10 handle scales. Not overly sharp on arrival and I hate the sheath it is not as pictured and was a dissapointment. I am not sure hat I will do but maybe make my own leather one. Great deal for a hefty blade... Will get the job done in a pinch. Knife arrived sharp, but took it to my sharpener anyway, to get past factory edge. In two hours, had a very fine edge. Arrived with handle scales loose, but were easily tightened. Scabbard covers handle of knife so is difficult to draw.The loose handle scales and problematic scabbard is why I gave the knife 4 stars. No problems with the quality of the knife. Excellent grip, sturdy and durable steel, and arrives quite sharp. I really like this knife, especially under it's sale price, but I do not like the sheath that it comes with. I did not get the one that is in the picture, it is as long as the entire knife. I cannot easily grab it from my belt because the sheath is blocking handle. I give the knife itself 5 stars, but the sheath brought down the score by 1 star. Awesome knife for the price, really heavy sturdy in your hand and a real nice fit. How ever it is bot a 'dagger' a complete let down in that aspect so watch out. High quality for the price. If you're wonderng if its worth the price it is, seriously buy two. The steel is good and thick, and the handle is well done. Sheath is okay but i have no complaints. Comes sharp. Had to write this review because I liked it so much.